So, all I've been able to manage on Monday night's game against Kansas is pretty incoherent (all of my text messages consisted of AHHHHHHHH with varying amounts of H's, or, even more eloquent, dlgkjrehwolamZbdbd!!!!). It all boils down to finding words as I try to blend two moments in my memory: 57-59 and 80-74. More has happened between those two scores than can be numbered or explained, to everyone whose heart throbbed on that cold Sunday in Detroit. Four years (nearly) is a decent chunk of time. You move on. You ride on a bus through the night and go straight to class. You celebrate; you graduate. Memory becomes history. And then, one night several Decembers later, it all slams back into you, full-fledged and fiery. Memory becomes fresh. Present becomes possibility. I sat in my living room screaming at the television, clicking my tongue, waggling my fingers, mouth dry from swearing. Granted, I do that during most games, but this was different. I don't feel like I have ever been good at describing the significance of our Elite Eight run and how it scrambled and shook my life, and many lives, with impacts of every magnitude. It is, simply, the story that has made me realize what a story can really do and be: you watch something begin, and move, and change and grow and fill, all within the parameters of your daily life and community -- and then, you watch it begin to seep out and into the world in ways that were never expected. An NBA star that goes back to school? TWO foundations -- one to fight malaria, and another to promote faith, education and athletics in Africa (taking me to Nigeria and back)? An immortal lobster mascot? People, and moments, and love, and words, and travels, I could go on...? This team and these guys, they're another from-the-start story I've been lucky enough to watch. They committed to Davidson because of what they saw that week in March, but also, I'm sure, because they wanted an excellent education, a strong community, and a team that plays as a team. They are team people. Their coach is a team person. And they know the possibilities that stem from being that. It has been so much fun to watch them grow together. On Monday, watching them was especially wonderful. On Monday, they became imprinted forever as a Wildcat team to remember. One five, not five ones. Little things. Hustle back. Don't allow second chance points. Free throws. A wild-eyed, hyped-up, cheering bench (no matter who was taking a breather). Oh, and zero second half turnovers (after, well, a hefty first half stat). Around 11:06 p.m. EST, when that #12 kid squared up with an arm smack in his face and 2 seconds on the shot clock, and BURIED IT! (thanks, ESPNU announcer), and after I had stopped shrieking, it became clear for about the ten millionth time why I love this ever-shifting story. Because even when we can't all be in the 900 Room, or Belk Arena, or Ford Field -- even when those days are behind us and we are adults, working and scattered -- we are together. My phone buzzed and buzzed and buzzed. Facebook and Twitter became an explosion of likes and retweets. It sounds so superficial on one level -- but like the echoes of "WE BELIEVE" roaring through fifty thousand seats, it is a reflection of family. 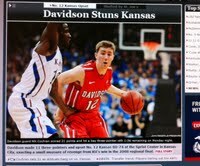 I just googled "Davidson Kansas" images. It's kind of cool, because pictures of Stephen Curry, Andrew Lovedale, Bryant Barr and Jason Richards are now interspersed with pictures of Nik Cochran, JP Kuhlman, Tyler Kalinoski and De'Mon Brooks. Two epic games to witness. And I realize: these two memories aren't blended, nor should they be. Because of the first, sure, the second is sweeter. But each took different journeys, and new moments will now spring forth. The circle of stories widens with each night, and that's my favorite part.